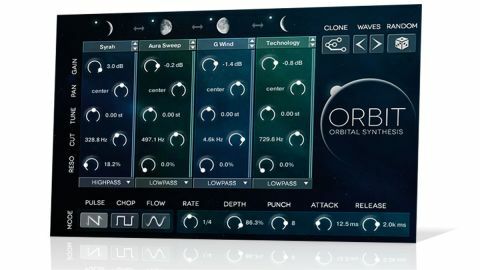 For textures, soundscapes and rhythm beds, Orbit sounds phenomenal, programs intuitively, and is worth every penny. Ideal for soundscapes and rhythm beds. Superb sounds. Ease of use. At the core of this 840MB Kontakt Player library is the "Orbit engine", which sequentially crossfades between four sample players, each drawing on an extensive menu of lengthy mood-categorised (Dark, Dreamy, Mysterious, etc) samples, and sporting its own Gain, Pan, Tune and filter controls. "A stack of master effects applies distortion, delay, convolution reverb and more"
Rhythms are generated using an amp-modulating LFO on the output, which can be switched between saw (Pulse), square (Chop, including a Width control) and sine (Flow) waveshapes, while an Attack/Release envelope enables fading in and out. Four up-to-64-step modulation sequencers are assignable to most of Orbit's parameters, and come with processing and shaping functions (Soften, Straighten, numerous quantises, etc). Finally, a stack of master effects applies distortion, delay, convolution reverb and more, and keyswitches toggle the Orbits and sequencers, and mute the output.